Sultan-ul-Ashiqeen Sultan Mohammad Najib-ur-Rehman is the present Shaikh of Sarwari Qadri Order. He took unprecedented steps to spread the teachings of Faqr and beneficence of Ism-e-Allah Zaat. In the past, beneficence of dhikr (invocation) and tasawur (contemplation) of Ism-e-Allah Zaat was limited to chosen seekers of Allah only. No doubt, t is the greatest favour of Sultan-ul-Ashiqeen that he made it common for everyone. For this purpose, he travels to the length and breadth of country and blesses people with the lustrous light of marifa (gnosis of Allah). Out of the scheduled tours one was held on Friday 18th January 2019. A number of disciples from Lahore joined this tour. The caravan along with Sahibzada Sultan Mohammad Murtaza Najib departed for Meharpur Sayed Wala, a village near district Nankana Sahib, at 12 noon under patronage of Sultan-ul-Ashiqeen, where Mohammad Rizwan Sarwari Qadri was impatiently waiting for their arrival. After a long travel of three hours when the caravan entered the village, people were standing along roadside with flower petals in their hands to welcome them. Moreover, the atmosphere echoed with the slogans of Allah-o-Akbar, O Prophet, O Ali and Sultan-ul-Ashiqeen zindabad (live long). The host Mohammad Rizwan Sarwari Qadri cordially welcomed Sultan-ul-Ashiqeen and Sahibzada Sultan Mohammad Murtaza Najib and garlanded them. In short, natives welcomed the caravan to the fullest. Mohammad Rizwan Sarwari Qadri also held a Mawlid ceremony. Venue was overcrowded with the disciples, devotees and people desirous to meet Sultan-ul-Ashiqeen. Program formally started with the recitation of Holy Quran after Sultan-ul-Ashiqeen graced the seat of honour. Mohammad Aslam Sarwari Qadri got the honour of recitation. After that, Mohammad Sajid Sarwari Qadri came to stage to present encomium by Mian Mohammad Bakhsh. People commended that heart touching encomium. During the program people had the privilege to meet Sultan-ul-Ashiqeen and to kiss his hands to show their respect and devotion. At the end of the program Mohammad Farooq Zia Sarwari Qadri prayed for everyone’s welfare. Moreover, a large number of people pledge oath of allegiance to Sultan-ul-Ashiqeen and got the eternal blessing of Ism-e-Allah Zaat (personal name of Allah). Mohammad Moghees Afzal Sarwari Qadri instructed them the process of invocation and contemplation of Ism-e-Allah Zaat and mashq murqoom-e-wajudia (inscribing Allah’s name on body). Besides, innumerable people also got Ism-e-Allah Zaat without oath of allegiance. Mohammad Sajid Sarwari Qadri instructed them the process of invocation and contemplation of Ism-e-Allah Zaat. After that, langer (sacred food) was distributed among the devotees. Before departure, family of Mohammad Rizwan Sarwari Qadri had the honor to meet Sultan-ul-Ashiqeen. The caravan of Sultan-ul-Ashiqeen Sultan Mohammad Najib-ur-Rehman reached the village of Mohammad Ehsan Sarwari Qadri at Chak 378 GB Hamandke Jaranwala, Faisalabad. At the entrance of the village people were standing to welcome them with flower petals in their hands. Besides, banners having details of this visit were hanging along the walls. Due to their utmost desire to meet Sultan-ul-Ashiqeen, people were raising slogans of live long Sultan-ul-Ashiqeen and Sultan-ul-Ashiqeen is the Reviver of Religion. The host served the honourable guest with tea and sweets. After that, a large number of seekers got Ism-e-Allah Zaat with and without oath of allegiance and started their journey of marifa. Furthermore, local disciples met their beloved spiritual guide. From Chak 378 GB Hamandke this caravan moved to the house of Mohammad Babar Sarwari Qadri at Chak 459 GB Bholi Di Jhok Jaranwala. The villagers cordially welcomed Sultan-ul-Ashiqeen by showering flowers of petals and raising ecstatic slogans. At his house, innumerable people came to meet Sultan-ul-Ashiqeen. Moreover, a large number of seekers got Ism-e-Allah Zaat with and without oath of allegiance. In different meetings with male and female disciples Sultan-ul-Ashiqeen listened to and prayed for their difficulties. Afterwards they moved to Chak 570 GB Kandianwala where Mohammad Arshad Ramzan Sarwari Qadri had made necessary arrangements for their night stay and dinner. The caravan reached there at 9 pm. Mohammad Arshad Ramzan Sarwari Qadri along with the villagers and members of Tehreek Dawat-e-Faqr’s Invitation department warmly welcomed them with flowers and slogans of Sultan-ul-Ashiqeen’s praise. Sultan-ul-Ashiqeen also met them with great affection. After that, the host served them with langer (sacred food). Moreover, for the purgation of innerself and Divine closeness, a large number of seekers got the eternal blessing of Ism-e-Allah Zaat. Visitors kept coming to meet Sultan-ul-Ashiqeen till late night. Furthermore, Mohammad Arshad Ramzan’s wedlock was on the same day. Sahibzada Sultan Mohammad Murtaza Najib, management of Tehreek Dawat-e-Faqr and the members of invitation department participated in the holy wedlock. Next destination of Sultan-ul-Ashiqeen’s caravan was the blessed house of Mohammad Sharif Khan Sarwari Qadri. On Saturday, 19 January 2019 after breakfast the caravan proceeded towards his house at Chak 569 GB Abdullah Khan, Jaranwala. It was not very far from the village of Mohammad Arshad Ramzan Sarwari Qadri. After their warm welcome, the honourable guest was served with dessert and tea. There hundreds of seekers got Ism-e-Allah Zaat with and without oath of allegiance. Hence, started their spiritual journey. The gracious spiritual guide, Sultan-ul-Ashiqeen prayed for the good fortune of whole family of Mohammad Sharif Sarwari Qadri. Namdarwala is the village where an ardent lover of Sultan-ul-Ashiqeen, Malik Ameer Sultan Sarwari Qadri lives. He along with the villagers welcomed Sultan-ul-Ashiqeen with great zeal. Meaning: Our spiritual guide is the manifestation of Divine beauty and righteousness. At that moment whole gathering enthusiastically chanted Allah-o-Akbar and O Prophet. After benedictions, seekers of Allah were blessed with Ism-e-Allah Zaat with and without oath of allegiance. Malik Ameer Sultan Sarwari Qadri had arranged ample langer (sacred food). Mohammad Aslam Sarwari Qadri led noon (Dhuhr) salat. After salat, langer (sacred food) was distributed among devotees. After that, Sultan-ul-Ashiqeen prayed for the well-being of Ameer Sultan’s family and moved on to the village of Abdul Majeed Sarwari Qadri. When the caravan of Sultan-ul-Ashiqeen along with Sahibzada Sultan Mohammad Murtaza Najib reached at Chak 656/7 GB Buchiana Mandi Jaranwala, the atmosphere of village echoed with the chants raised by disciples and devotees of Sultan-ul-Ashiqeen. Subsequently, Abdul Majeed Sarwari Qadri served the guests with tea and sweets. Moreover, devotees and seekers of Allah kept coming at his house to meet Sultan-ul-Ashiqeen. Meanwhile, countless seekers requested to have oath of allegiance. Their request was accepted and approved by kindhearted Sultan-ul-Ashiqeen Sultan Mohammad Najib-ur-Rehman. Moreover, innumerable people also got Ism-e-Allah Zaat without oath of allegiance. Before leaving the village Sultan-ul-Ashiqeen honored the family to meet him and prayed for them. Same as the people of all other villages, people here were also very hospitable. They cordially welcomed Sultan-ul-Ashiqeen by showering flower petals and raising slogans. Mohammad Siddique Sarwrai Qadri had arranged delicious langer (sacred food) and made necessary arrangements for their stay. People desirous of benevolence kept coming to his house to meet the perfect Fakir, Sultan-ul-Ashiqeen. So, they filled their hearts with Divine light. Remarkably, hundreds of seekers of Allah got Ism-e-Allah Zaat after oath of allegiance. Moreover, Sultan-ul-Ashiqeen blessed innumerable people with the Divine beneficence of Ism-e-Allah Zaat without oath of allegiance. Meaning: The full moon rose over us and it is incumbent upon us to show gratitude. Gracious spiritual guide prayed for the wellbeing of the family and distributed beneficence of Ism-e-Allah Zaat there too. When the caravan entered the village, devotees were standing respectfully along the road sides. Mohsin Raza Sarwari Qadri had decorated roadsides with different colorful objects from entrance till his house. He served the guests with tea and snacks. Meanwhile, devotees started to gather outside his house to see their beloved spiritual guide. In different meetings, many male and female disciples pledge oath of allegiance to Sultan-ul-Ashiqeen and got Ism-e-Allah Zaat for the purgation of innerself and Divine closeness. Moreover, innumerable seekers got Ism-e-Allah Zaat without oath of allegiance. Everyone was so happy that it seemed like an event of celebration. Before leaving for next destination Sultan-ul-Ashiqeen listened to and prayed for the problems of devotees standing in his way. Meaning: O Prophet all the pleasures in my life are due to your benevolence. That beautiful poem warmed the hearts of attendees. Mohammad Sajid Sarwari Qadri presented Abyat-e-Bahoo so beautifully that engrossed the attendees. After benedictions, seekers of Allah pledge oath of allegiance to Sultan-ul-Ashiqeen and got great blessing of Ism-e-Allah Zaat. Moreover, a large number of devotees got first level of invocation. After the distribution of langer (sacred food) caravan left for Lahore. Members of Tehreek Dawat-e-Faqr’s Divisional Management, Faisalabad came along the caravan till divisional boundaries to say good-by to their beloved spiritual guide. After successful distribution of benevolence of Ism-e-Allah Zaat Sultan-ul-Ashiqeen reached Sultan-ul-Ashiqeen House, Lahore at 5 pm. Sultan-ul-Ashiqeen Hazrat Sakhi Sultan Mohammad Najib ur Rehman is possessor of the Divine Trust and inheritor of Faqr. On Sunday 27th of January, 2019 he made a one-day tour to Pattoki in district Kasur and Renala Khurd, Okara. His aim was to spread blessings of Ism-e-Allah Zaat (Personal Name of Allah). A few days before departure of Sultan-ul-Ashiqeen, the assigned department of preachers had already set out to Pattoki. People in charge informed the disciples and followers beforehand that their Spiritual Guide was going to honor them with his prestigious presence. They had since been awaiting eyes. Prior to his arrival, the surrounding areas of the town were covered with banners and flexes to announce the meeting. It was an open invitation to every resident that he may join, greet and receive his blessings. The caravan set out at 8 in the morning from Sultan-ul-Ashiqeen House. Many of the disciples had joined in. It was a beautiful day. The shining sun and aromatic breeze added to the grand arrival of Sultan-ul-Ahiqeen. Throughout the journey all seekers of Allah seemed delighted. The caravan reached Pattoki at the residence of Mohammad Tanvir around 9:15 am. Disciples and followers from all around the town and surrounding cities had crowded in to welcome Sultan-ul-Ashiqeen. As soon as his vehicle got visible, people started chanting “long live Sultan-ul-Ashiqeen” all over the place. The atmosphere scented of rose petals. The love and admiration of Sultan-ul-Ashiqeen drenched the hearts of seekers of Allah. Just as the sight of the lovers landed on his glowing face, their restlessness seemed to vanish. People tossed rose petals at his vehicle to portray their enthusiasm. The fragrant presence of Sultan-ul-Ashiqeen made the seekers of Allah feel blissful at soul. The local residents stood awestruck by his enlightened spiritual personality. While the entrance was echoing of chants praising him, he stepped inside the residence of Mohammad Tanvir. Both Tanvir and his father placed flowers garlands around his neck. So then, he hugged them as a gesture of love. Mohammad Tanvir had arranged a huge breakfast for the disciples as well as the locals. After the breakfast, Maulana Mohammad Aslam Sarwari Qadri gave a speech. He explained the importance of the Ism-e-Allah Zaat as well as that of a spiritual guide. After this Sultan-ul-Ashiqeen joined the gathering when once again the attendees began chanting to praise him. The entire crowd stood up on their feet in his respect welcoming him. Moving forward, Maulana Mohammad Aslam recited a few verses of the Quran which were followed by encomiums by Sajid Ali Sarwari Qadri. His voice and words touched the hearts of people present who found themselves completely overwhelmed. Afterward, Mohsin Raza Sultani who recited another encomium and which too was appreciated. Chants exalting Sultan-ul-Ashiqeen were enough to increase people’s ardent interest. Towards the end, Sajid Ali Sarwari Qadri delivered the quatrains of Sultan Bahoo. Finally, Maulana Mohammad Aslam Sarwari Qadri prayed to Allah. A lot of people present in the gathering pledged oath of allegiance to Sultan-ul-Ashiqeen. They received the Ism-e-Allah Zaat and swore to devote their lives to him. Numerous people acquired the first stage of the Personal name of Allah without the oath of allegiance for purgation and ascent of their inner selves. After enlightening the hearts of men, Sultan-ul-Ashiqeen gave females that were present an opportunity to take the oath of allegiance. Many interested women did so who want to achieve the vision of Allah on the path of Faqr. They were also blessed with Ism-e-Allah Zaat and exercise of inscription of Allah’s name on the body. After successfully bestowing the people of Pattoki, Sultan-ul-Ashiqeen departed to Renala Khurd, district Okara. The caravan under the supervision of Sultan-ul-Ashiqeen arrived at Renala Khurd around noon at 12:30 pm. Subsequently, they reached the residence of Mohammad Sufyan Sarwari Qadri. The local people including those from outside the city were anxiously waiting to warmly welcome Sultan-ul-Ashiqeen. Over there, they stood in queues holding flower petals to toss at his ride. They were sweetly chanting in high voices to welcome Sultan-ul-Ashiqeen alongside Sultan Mohammad Murtaza Najib. Before they entered the crowd, Mohammad Farooq Zia Sarwari Qadri introduced them to the people in detail. Also, he mentioned the magnificence and bounties of Ism-e-Allah Zaat. He then invited the comers to take the oath of allegiance without a second thought, considering Sultan-ul-Ashiqeen’s visit a blessing. Furthermore, he explained how this would be the only way to correct both their physical and spiritual lives. And that it is about time they adopt the path of righteousness. Sultan-ul-Ashiqeen entered the crowd of people. Consequently, the chanting took place once again. As soon as he appeared on the stage, people began kissing his hands. His followers felt their hearts at peace as they were having his glorious vision. In the beautiful weather the encomiums sounded even more wholesome. The introductory speech was delivered by the chief-executive, Malik Naeem Abbas Khokhar. He then invited Maulana Mohammad Aslam Sarwari Qadri on the stage to recite Quranic verses to formally begin the event. Mohsin Raza Sarwari Qadri got an opportunity to present an encomium in Prophet Mohammad’s honour. Then Mohammad Ramzan Bahoo recited an encomium. It was highly appreciated by the listeners. In addition, Sajid Ali Sarwari Qadri recited encomiums followed by mystic poetry of Sultan Bahoo. Lastly, Mohammad Farooq Zia led the final prayer made to Allah. Sultan-ul-Ashiqeen took the oath of allegiance from the ones willing. He bestowed them with Ism-e-Allah Zaat and the golden opportunity to devote their lives to him. Other than that, hundreds of people received the Ism-e-Allah Zaat for purgation of their inner selves without the oath of allegiance. Purgation and correction of the inner self and inward is not only desired by men. Women too, in large numbers, took the oath of allegiance at the hands of Sultan-ul-Ashiqeen. They had been longing for this moment. Sultan-ul-Ashiqeen brought their souls to peace by giving them the Ism-e-Allah Zaat. He prayed for their good future in the path of Faqr. They distributed food among people. After which they offered the Zuhr Prayer alongside Sultan-ul-Ashiqeen. Mohammad Sufyan Sarwari Qadri introduced his family to him and received his blessings and love. The caravan finally departed for Lahore and reached at 5:30 pm. After having thousands of people blessed spiritually, this tour came to a successful end. Tehreek Dawat-e-Faqr celebrated urs of Sultan-ul-Arifeen Hazrat Sakhi Sultan Bahoo on 10th February at the Khanqah of Sarwari Qadri order. Sultan-ul-Ashiqeen Sultan Mohammad Najib-ur-Rehman presided over the ceremony. Devotees from all over Pakistan attended the ceremony. Devotees present in the Khanqah warmly welcomed Sultan-ul-Ashiqeen upon his arrival. The ceremony officially started once Sultan-ul-Ashiqeen settled into his position. Naeem Abbas Sarwari Qadri compered the event, during which disciples and devotees had the honour to kiss Sultan-ul-Ashiqeen’s blessed hands one by one. Explanation: The Holy Prophet’s love is creating such an ardent feeling of longing in my heart that I fear becoming unconscious. Following that, Moshin Raza Sultani read the below eulogy in honour of Sultan Bahoo. The audience highly praised and liked it.. Explanation: My beloved Haq Bahoo is in eternal state of invoking Allah Hoo. Naeem Abbas then invited Qari Mohammad Aslam to present a detailed biography of Sultan Bahoo. Mohammad Aslam delivered a comprehensive speech, covering Sultan Bahoo’s birth and life history as well ashis exalted spiritual status in esoteric world. He also talked about Sultan Bahoo’s exoteric and esoteric oath of allegiance.Undoubtedly, Sultan Bahoo is one of the very highly accomplished Saints of the 17th century. He is certainly stationed at the grand status of Sultan-ul-Faqr V. Qari Mohammad Aslam also informed the audience about Sultan Bahoo’s teachings and the ongoing beneficence of Sarwari Qadri order. Mohammad Ramzan Bahoo then read few verses of Abyat-e-Bahoo. Mohammad Aslam Sarwari Qadri read khatm Sharif and made a supplication. In the end, Mohammad Sajid and Mohsin Qadri presented salutations in the court of the Holy Prophet. Naeem Abbas told the audience about the upcoming event on 21st March 2019 and invited them to attend. Tehreek Dawat-e-Faqr celebrates this day every year with zeal and fervour as the day of transfer of Divine Trust to Sultan-ul-Ashiqeen by his spiritual guide Sultan-ul-Faqr VI, Sultan Mohammad Asghar Ali. People took oath of allegiance on the hand of Sultan-ul-Ashiqeen, after which Sultan-ul-Ashiqeen granted a framed Ism-e-Allah Zaat (Personal name of Allah) to the new disciples. Invocation and contemplation of Ism-e-Allah Zaat is key to enlightenment of soul and for attaining gnosis and closeness of Allah Almighty. Before leaving, Sultan-ul-Ashiqeen met all the devotees individually and made supplication for everyone. Following that, the on duty disciples served the special meal to guests and thus this blessed gathering came to an end. Sultan-ul-Faqr Publications participated in the book fair organised by Lahore International Book Fair at the Expo Centre Lahore from 1st to 5th February 2019. The Sultan-ul-Faqr Publications’ team had decorated the stall beautifully. They had also displayed flexis of various sizes in and around the stall. The team had also placed a number of standees at various locations around the hall to provide introduction to Sultan-ul-Faqr Publications’ books. Sultan-ul-Arifeen’s books that have been translated from Persian to Urdu and English and also Sultan-ul-Ashiqeen’s Urdu books and their English versions were prominently displayed. Sultan-ul-Faqr Publications’ team warmly welcomed visitors at the stall and introduced them to various books on display. Moreover, they also briefed about Sultan-ul-Ashiqeen’s tireless efforts that are the reason behind Sultan-ul-Faqr Publications’ success. The hosts at the stall of Sultan-ul-Faqr publications gave a free copy of Sultan-ul-Faqr magazine to all visitors in addition to the pamphlets containing social media links and website details. This was so that people can access the books that are available on Sultan-ul-Faqr Publication’s websites free to download or read online. Devotees who appreciate spirituality, highly praised the stall and high quality of books on display. Sultan-ul-Faqr Publications maintains a very high standard of printing and publication. The books are printed on high-quality paper so that readers do not face any difficulty when reading. Additionally, there was a special discount of 50% on all Sultan-ul-Faqr Publications’ books at the book fair so that as many people as possible could benefit. Resultantly, hundreds of people bought these books during the fair. The visitors liked Sultan-ul-Faqr Publications’ books and highly appreciated the team’s efforts. Many devotees expressed their desire to meet Sultan-ul-Ashiqeen and enquired about Faqr. The team representing Sultan-ul-Faqr Publications at the stall answered these questions comprehensively..
Ahsan Ali, Mohammad Rashid Gulzar, Sher Ali and Mohammad Amir represented Sultan-ul-Faqr Publications’ stall. In addition, Dr Abdul Haseeb, Dr Sarfraz, Prof. Hammad ur Rehman, Hafiz Waqar Ahmad, Mohammad Rasheed and Mohammad Ihsan also participated on behalf of Sultan-ul-Faqr Publications. Moreover, Saeed Jaffar, Mohammad Shahzad, Abdul ur Rehman and Ahsan Raza represented the digital productions wing of Sultan-ul-Faqr Publications. They not only made an excellent photo coverage of the stall for five days but also recorded videos. Sultan-ul-Faqr Publications’ chief executive, Malik Naeem Abbas also supported the event and above all our beloved spiritual guide Sultan-ul-Ashiqeen guided esoterically and exoterically. Lastly, Sultan-ul-Faqr Publications’ team thanked them all and appreciated their support. May Allah Almighty reward them for their support, Ameen. Tehreek Dawat-e-Faqr (Regd.) is the only organisation in the world today that is propagating and preaching the path towards gnosis of Allah Almighty and Divine presence. Without doubt, it is working hard in today’s materialistic era in connecting the mankind with their Lord. The central office of Tehreek Dawat-e-Faqr is located at Sultan-ul-Faqr House, 4-5A Extension, Education Town, Wahdat Road, Lahore. The organisation is working hard in inculcating the masses to enjoin good and forbid evil whilst catering to this era’s requisites. Founder and patron in chief of Tehreek Dawat-e-Faqr, Sultan-ul-Ashiqeen Sultan Mohammad Najib-ur-Rehman has set up regional offices of the organisation to spread the message of gnosis of Allah Almighty. These regional offices are working very hard in spreading the message within their respective areas. 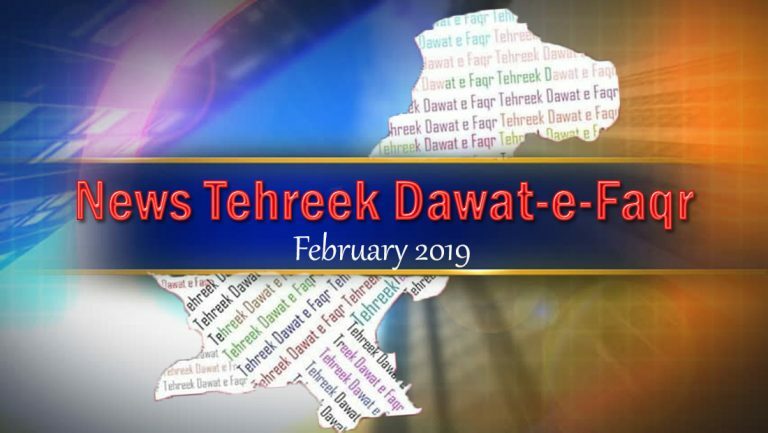 Below is a selection of news from Tehreek Dawat-e-Faqr’s regional offices across Pakistan. Nasir Majid Sarwari Qadri arranged a teaching session of selected portions from book Shams-ul-Fuqara at his house on Friday 18th January 2019. The attendees highly appreciated this effort and who requested to make this a regular session. Regional members of Tehreek Dawat-e-Faqr organized a book stall displaying books of Sultan-ul-Faqr Publications at the grand mosque in Kala Gujran, Jhelum. Sultan-ul-Ashiqeen’s books Haqeeqat Ism-e-Allah Zaat (The Divine Reality of Ism-Allah Zaat) and Murshid Kamil Akmal (The Perfect Spiritual Guide) attracted a lot of attention from thevisitors. Mohammad Tariq of Tehreek Dawat-e-Faqr Uch Sharif, organised a teaching session of Shams-ul-Fuqara. In order to spread the message of Faqr in his area, Mohammad Tariq regularly organises such gatherings. The locals not only appreciate but also encourage Mohammad Tariq’s efforts by participating in these gatherings. In order to further guide the local people towards the path of Allah, Mohammad Tariq Sarwari Qadri again arranged teaching sessions of Shams ul Fuqara on 21st and 28th January 2019 at hishouse. The attendees were very excited and learned a lot. The regional office of Tehreek Dawat-e-Faqr Bhrot, organised a stall in Mahe Kalan village to display Sultan-ul-Faqr Publications’ books. Actually,the purpose of the stall was to spread awareness amongst local people about the soul of Islam i.e. Faqr. Faqr is Holy Prophet’s heritage. The Holy Prophet has been quoted saying: “Faqr is my pride and Faqr is from me”. The books on display at the stall included Urdu and English translations of Sultan Bahoo’s books and Sultan-ul-Ashiqeen’s books as well as their English translations. The regional devotees organised another stall at the grand mosque in Kambhi village after Friday prayer. A large number of people visited the stall where they bought many of the books on display. A Sultan-ul-Faqr Publications’ stall was set up at the G.T. Road grand mosque Sarai Alamgir on 8th February 2019. The locals highly praisedthe effort. On Friday, 11th January 2019 Mohammad Fiaz Sarwari Qadri led a teaching session at Mohammad Farooq Sarwari Qadri’s house. Alongside, he stressed on the importance to take oath of allegiance on the hand of a perfect spiritual guide and invocation and contemplation of the personal name of Allah Almighty. Thus, he invited the people to follow the path of Faqr in order to succeed in this world and hereafter. Ghulam Shabbir Sarwari Qadri held a teaching session on Friday 18th January 2019 at his house. On Friday 1st February a similar gathering was held at the grand mosque Gulzar-e-Medina.